I’ve just spent three full-on days at the British Bird Fair – the greatest birding show on earth, where 25,000 birders rampage through a dozen massive marquees in search of optics, bird tours, art work and well-known personalities. 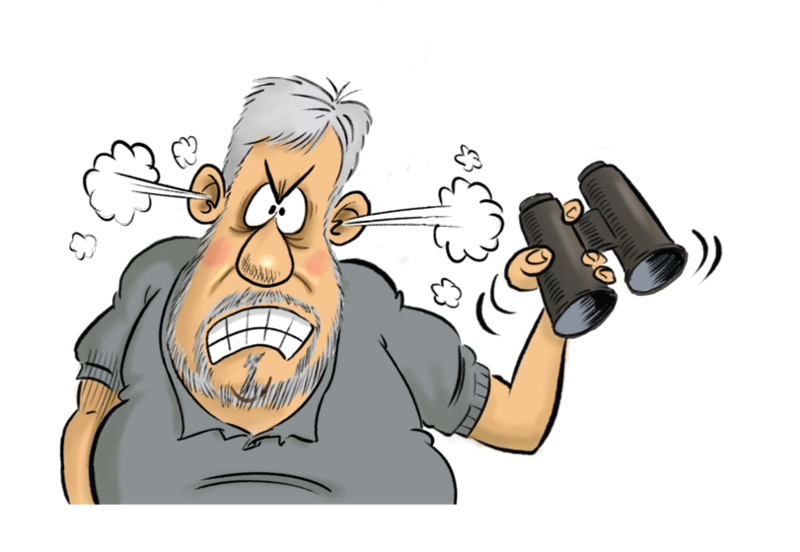 The Oddies, Dilgers, Lindos and Packhams of this birding world are subject to sycophantic assaults and sheer adoration by virtue of their TV appearances. Common birders genuflect or laugh hysterically, if the objects of their desire so much as acknowledge their existence. Us D listers, minor birding celebs, get plenty of affirmation from web fans and grumpy article aficionados, but it generally falls short of stalking or being pelted with warm underwear. However, I do meet hundreds of people and chat to them, listening to their needs, desires and even, on occasion, praises. While doing so the Public Address system will be red hot with use, as events are advertised and raffle prizewinners are declared. It nearly reaches breaking under the strains of Johnny Kingdom announcing his forthcoming talk. Sandwich sellers will vend their wares loudly and with celestial bells ringing while a host of birders create an unangelic hubbub well above their fighting weight! I am, in any event, 90% deaf in one ear… by day three I am only able to nod and smile, as I desperately try to read lips, name badges, facial expressions and notes that Maggie hands me in order to get a clue as to what is going on. At the best of times you can confuse me just by asking what I want for dinner, but deafen me beyond my normal disability, and I can barely spell my own name or remember what I scoffed for breakfast. The confusion is further exacerbated by my in-built inability to recognise anyone I don’t actually live with. As I said at the BBF, one thousand, eight hundred and twenty seven times, I never forget a face, nor a name, but I am rarely able to put the two together. This can, of course, be embarrassing for me and insulting to the person I’m trying to hold a conversation with. Is there anything more galling than a name badge, which is either illegible or turned volte-face? Worse still one, which also covers up the company name on the polo shirt! I managed to turn a BBC Wildlife Cameraman into someone I once arranged a trip for, and the Director of an ornithological society into a ‘Birding For All’ member. I then called someone Anthony throughout a 15-minute conversation, only to find out later that Anthony was his surname! Despite this, exhibiting at the fair is affirming fun, one of the most enjoyable things you can do that isn’t fattening and is neither illegal nor immoral. However, it is a great deal of hard work, and I find it very physically draining. I don’t suppose I have ever mentioned my arthritis in any of my articles? Being so stoic and self-effacing I have probably kept this from the reading public. I bravely soldier on, surprisingly un-rewarded with medals, not even seen on the birthdays honours list, it’s a shame as GOB OBE has such a ring to it. I’ve suffered for more than forty years from this disease. However, it was only five years ago that I found out that it has a symptom other than pain, skeletal shrinkage and curvature… apparently it also causes deep fatigue. So it turns out I’m only half as idle as I thought I was! By the time our stall is all set up on the Thursday I am wiped-out. I can barely manage an early evening pint before crashing out. So, on Friday morning, am I ready to meet all the show-going birders? Most decidedly not! I am exhausted. There you have it, just call me exhausted, deafened and confused, formerly of Tunbridge Wells. Ahhhh…, you are probably wondering about the ocular danger I mentioned at the outset? Well, this is a very sad tale of misunderstood motivation coupled with the overactive and evil mind of ‘she who must be obeyed’. Sometime on the Saturday the confusion, deafness and exhaustion was showing in my demeanour – I know, you are going to find it hard to believe that I am not always brimming over with bonhomie. My face was ashen and my spirits low, I could barely whisper a plea for a fresh coffee and a blueberry muffin, as I held court in my ‘office’ – that’s a corner of the stand with two canvas seats and a large electric fan. It was, and I am prepared to say this in court if necessary, purely a co-incidence, that I made the supreme effort to perk up, at the exact moment when I was visited by two young ladies from Sweden. My head was bowed so low with fatigue that I had to be told later how attractive and blond they both were. I became animated for no other reason than that I knew I had to make the effort for my adoring public. I think that, while this would not have passed unnoticed, it would not have been sufficient for Hawkeye to begin to sharpen a stick, let alone wave it dangerously close to my orbits. That only came about when they asked for a photograph with me. It is my fault that, just make sure they were in the frame, they had to put their arms around my neck, and press their cheeks against my grizzled jowl?